Dusit Dream: Experience the excitement of Bangkok, the tranquility of the mountainous Chiang Mai region, the ’Golden Triangle’ and Chiang Rai’s hill tribes and top it all off by ending your tour on some of the world’s best beaches in Phuket. Tuesday: Arrive Bangkok and check-in to the Dusit Thani hotel. Wednesday: Spend the day in Bangkok. Why not visit some of the numerous ancient monuments, sites and buildings, museums or temples such as The Grand Palace or Wat Phra Kaeo, home to the world-renowned Emerald Buddha. Thursday: Spend the day in Bangkok. You could devote this day to shopping at, for example, the world-famous Thieves’ Market or the bazaar on Phahonyothin Road. If you need to relax after this, why not round off the evening with a dinner cruise on the Chao Phraya River to experience the ‘Venice of the East’ from a different perspective. Friday: Fly from Bangkok to Chiang Mai and check-in to the dusitD2 hotel. Saturday: Spend the day in Chiang Mai, Thailand’s ‘Rose of the North’. You could wander around the old walled city or make the trip to the famous temple of Doi Suthep which overlooks the city from a mountainside eight miles away. Spend the evening perusing the city’s bustling Night Bazaar. Sunday: Fly from Chiang Mai to Chiang Rai and check-in to the Dusit Island Resort. 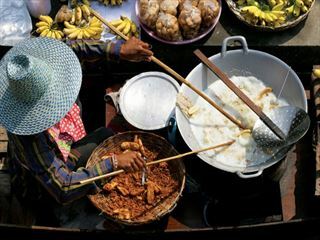 Monday: Spend the day in and around Chiang Rai. Activities here include a visit to Chiang Saen – home of numerous ancient ruins or a trek to Doi Hua Mae Kham - home to a number of hill tribe villages. 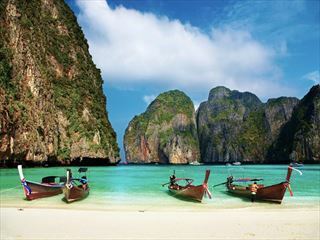 Tuesday: Fly from Chiang Rai to Phuket and check-in to the Dusit Laguna hotel. Wednesday: Phuket: This ‘Pearl of the Andaman’ with its limestone cliffs, white powdery beaches, tranquil broad bays, tropical forests, and range of varied resorts makes it one of the country’s most popular tourist destinations. Thursday: Phuket: Hit the beach! 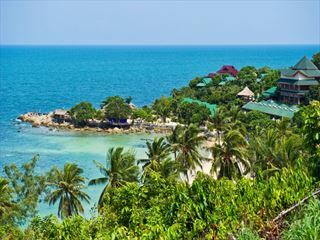 Whether you want to sample the frenetic pace of Patong or find solitude on a remote stretch of sand in the north, Phuket’s beaches have it all for the sun seeker. Friday: Phuket: Why not visit Siam Safari’s Elephant Conservation Project where you can learn about this magnificent animal before trekking over Phuket’s panoramic hills. Meet some of the elephants and see how they are trained. Have your camera ready for some great photo opportunities. Saturday: Phuket: Make some last minute purchases in this shopaholic’s paradise! The island has a great variety of shopping, from bustling open-air food markets, noisy night markets, street stalls and local shops, to western style department stores and upmarket specialist shops. Sunday: Return flight to the UK.